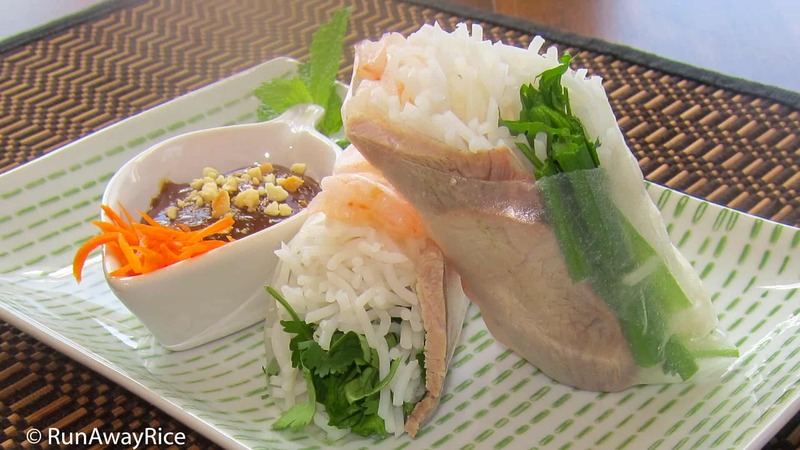 This recipe for Fresh Spring Rolls / Rice Paper Rolls with Pork and Shrimp (Goi Cuon) is the traditional Vietnamese recipe and they are not deep-fried as some people may think. They are often called “summer rolls” to differentiate them from their fried cousin, the Egg Roll (Cha Gio). These Fresh Spring Rolls / Rice Paper Rolls with Pork and Shrimp are fun to make and the filling possibilities are endless. (I’ll share more flavorful combinations soon but wanted to start with the basics first.) Have a spring roll making party. Ask friends to bring their favorite ingredients, such as fish, tofu, or veggies. Everyone can roll their own spring roll and share with the group. Yummy! Trim the pork so it’s approximately 6 inches long by 2-3 inches thick. Bring a medium pot of water to a boil. Season the water with salt. Transfer the pork into the boiling water. As soon as the water starts to boil again, reduce the heat to Low and cover the pot. Cook for 15-20 minutes or until the internal temperature of the meat is 155 F (68 C). Remove the pork and quickly immerse in an ice bath for 10 seconds. (This prevents the pork from turning brown.) Allow to cool. Slice the pork into thin slices about 1/8 inch thick. Dip a rice paper sheet into warm water making sure to wet the entire sheet. Gently shake off excess water and lay the rice paper on a cutting board. Wait 10 seconds for rice paper to soften. Put a small amount of rice vermicelli horizontally across the rice paper, approximately 1 inch from the edge. Place some cilantro on top of the noodles. Lay the garlic chives next to the noodles. Lay 3 slices of pork next to the chives. Lay 4 cooked shrimp next to the pork. When arranging the chives, pork and shrimp on the rice paper, place each ingredient in neat rows working your way toward the center of the rice paper. Carefully pull the lower edge of the rice paper up and over the filling and gently roll halfway. Fold the ends over and then finish rolling, making sure all filling is tightly wrapped in the rice paper. Use gentle pressure when rolling. Rolling with too firm hand will cause the rice paper to split. Set the fresh spring roll on a plate. Cover with a damp paper towel. Continue making the rolls until all ingredients are used. Enjoy these rolls while they are fresh. Serve these delicious Fresh Spring Rolls with the special dipping sauce and shredded carrot pickles.